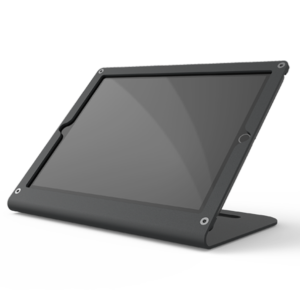 Display your iPad in style with the Heckler Design Windfall stand. Laser-cut from a single piece of steel, the Windfall is a secure, slim stand perfect for any counter-top. 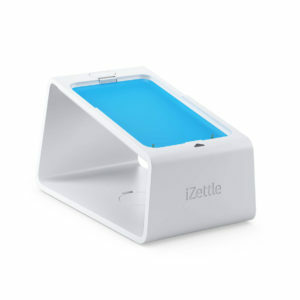 This cradle has a built-in battery charger for your iZettle Reader, so you never have to worry about the battery time. Tape the cradle to your desk to make sure it stays in place. Display your iPad Pro (12.9″) in style with the Heckler Design Windfall stand. Laser-cut from a single piece of steel, the Windfall is a secure, slim stand perfect for any counter-top. Powder-coated in a range of colours and compatible with iPad Mini (1,2,3 & 4). 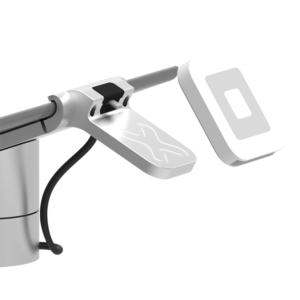 Add the optional pivot tack accessory for extra security. Freeform Made wooden iPad Stands are the first of their kind: an expertly crafted, minimalist, super-strong wooden iPad stand designed to stand out while blending in. 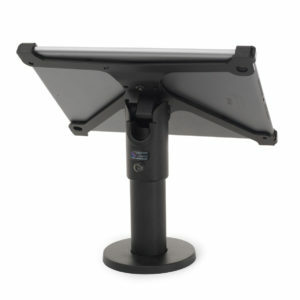 Frame stands are ideal for kiosks, Bluetooth credit card readers, as well as home and office use. Choose from sustainably harvested walnut and bamboo. 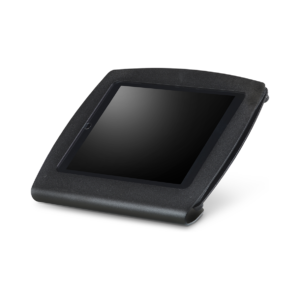 The M010 Retail Cradle makes taking seamless payments at a fixed POS and in-store easy. 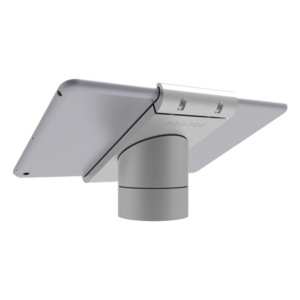 In a traditional payment environment, the integrated pole mount attaches to a desktop, securely holds, charges and provides USB communications. 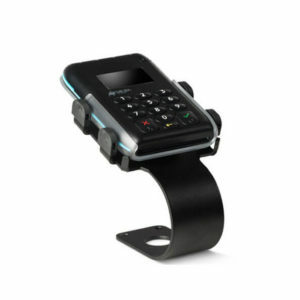 Quickly undock the M010 and the device is ready to take mobile payments. The Miura M010 is used by a number of payment solutions, including PayPal Here, Payleven and the iZettle Contactless Pro Reader. Built of heavy steel with a beautiful finish, @Rest is no flimsy gadget accessory—it’s high-end furniture for your tablet. Thanks to @Rest’s adjustable pegs, it’s compatible with virtually any tablet. @Rest is also sturdy enough to support your other technology loves, be it a MacBook Pro or the slim MacBook Air. Charging Cradle & AC Adapter for CHS Series 7. 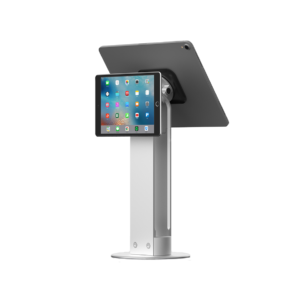 The ultimate POS stand for iPad and iPad Mini, built with feedback from existing retail and hospitality customers. 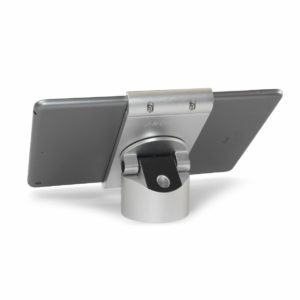 The Swivel POS Stand lifts (77mm) and angles your iPad at the ideal height and pitch, and optionally rotates smoothly 180 degrees for screen sharing with customers. We recommend a bolted/screwed installation but a strong 3M adhesive can be used instead. 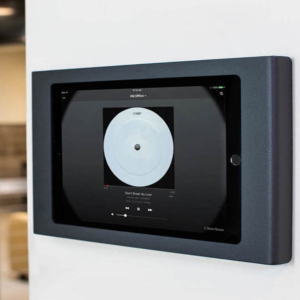 A built-in Kensington locking port gives you the option to secure your iPad. 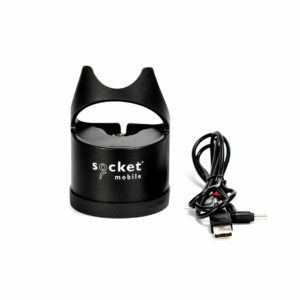 This Charging Dock charges the S700 series Socket Mobile products. Charge your scanner and remain serviceable at the same time. 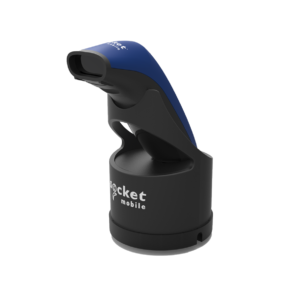 Providing a method to use the Auto Scan feature with 2D barcode scanners or the RFID reader, the dock is ideal for scanning from mobile devices. In addition, the ingenious design incorporates small magnets to align the charging dock and the scanner, helping to firmly secure the scanner to the Charging Dock. As a dock, the charging dock is stylish, eliminating ugly wires from site. 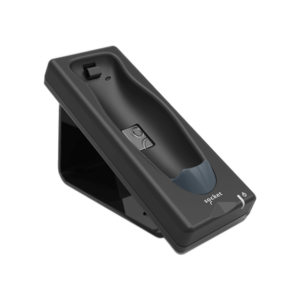 The Charging Stand for the 700 Series and Series 7 barcode scanners is designed to remain secure on any flat surface where you need to maximize barcode scanning efficiency and productivity. The ingenious design incorporates a small magnet built into the top of the mounting arch that makes contact with the magnet housed on the bottom of the scanners, helping to firmly secure the scanner to the Charging Stand. Seamless, elegant and durable Point Of Sale stand that’s designed to be the perfect option for every businesses. 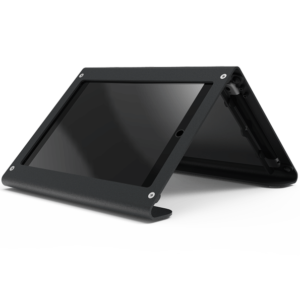 Adjust the screen angle or flip the screen smoothly to forward or rear facing orientations. Integrated cable routing provides for a clutter free setup that stays out of the way. 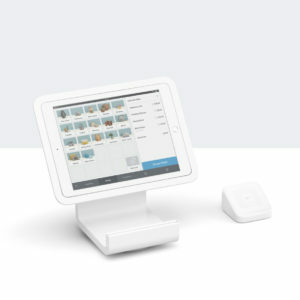 Connect an iPad, download Square Point of Sale and plug in hardware. You’re ready to accept every way your customers want to pay, right out of the box. iPad not included. 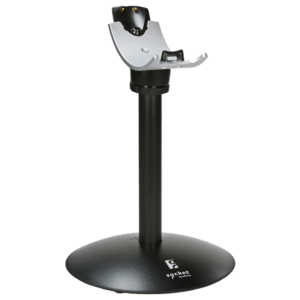 Designed with high-volume checkouts and future payment technologies in mind, this special WindFall Stand is a several inches taller than our traditional model. It’s structure is derived from of 10-gauge steel – 29% thicker than our traditional WindFall models. 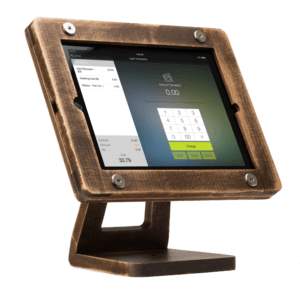 The result is an incredibly stable, beautiful, and minimal point-of-sale. 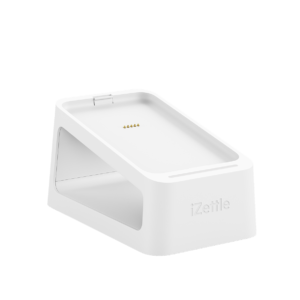 This cradle has a built-in battery charger for your iZettle Reader 2, so you never have to worry about the battery time. 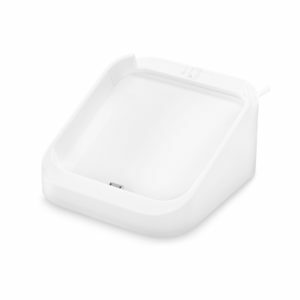 The dock for Square Reader keeps your reader charged and in place for seamless countertop transactions. 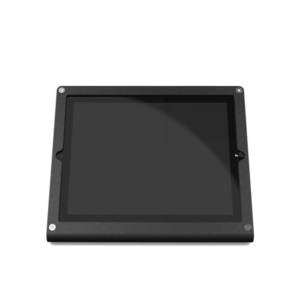 Weighing in at around 0.5 kg, the dock provides a stable base for the Square Reader so you can easily insert and remove chip and PIN cards for quicker transactions. 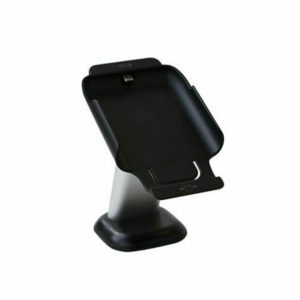 SpacePole desk stands are designed exclusively for each individual mobile payment device, offering a securely fitting cradle that allows the payment device to be removed for instant portability. 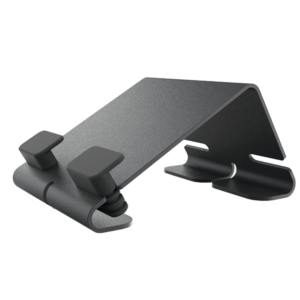 The C-shape desk stand attaches to a desk or counter giving a secure mounting option with a comfortable angled position. Add a cabled charge dock to an existing Proper Point of Sale setup. 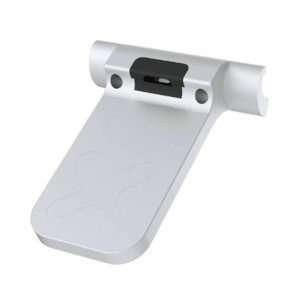 The Square Reader Dock replaces the clamp cap on standard model Lock Belts, adding stand and charge functionality. 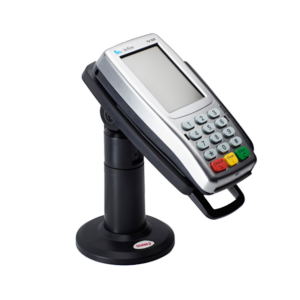 Conveniently position the Square reader for customer interaction, whilst ensuring it remains charged at all times. 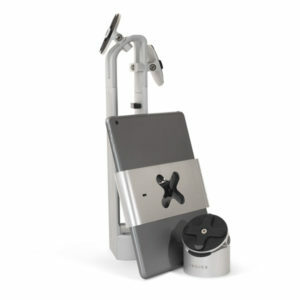 Compatible with all Studio Proper Mounts & Stands. Compatible with the Studio Proper Lock Belt range, the Miura M010 charge dock add-on turns your POS setup into a true all in one. Keep your M010 device fully charged, and perfectly positioned for customer interaction. 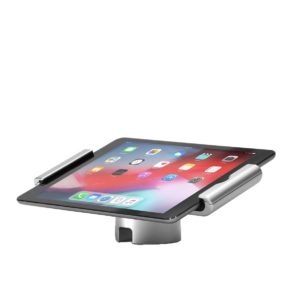 Versatile and ergonomic — The Studio Proper iPad Swivel Stand is designed to seamlessly and securely mount and display your iPad. 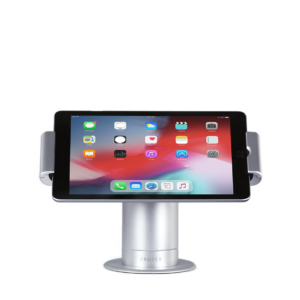 Combining 180° of swivel rotation for convenient customer interaction, and an ergonomically friendly 80° of angle adjustment; the Swivel Stand optimises the user experience of your iPad, and looks beautiful in every environment. With the included MFi certified Lightning cable, the Swivel Stand conceals your cables, and keeps your iPad locked securely into place, while remaining powered at all times. 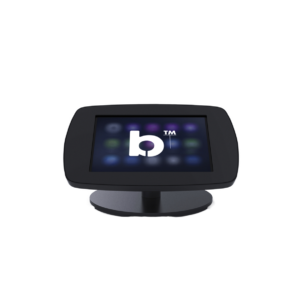 The most affordable and versatile mPOS stands we’ve ever have the pleasure to find! 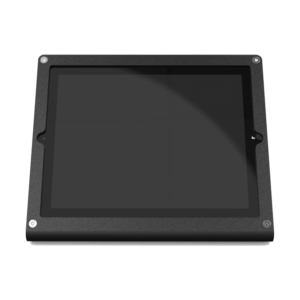 The Spacepole C Series Frame encloses any 10″ tablet into a secure POS unit. Available in white, red, yellow, green, blue and black these versatile stands are a perfect fit for all Samsung Galaxy 10″ tablets, iPads and iPad Airs as well as a wide range of other 10″ tablets. 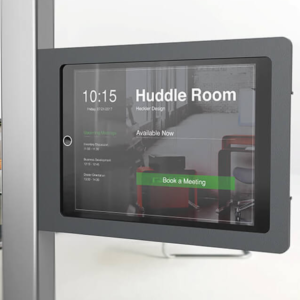 Easily mount an iPad outside your conference rooms and meeting rooms to create beautiful scheduling displays with the Heckler Design Side Mount. 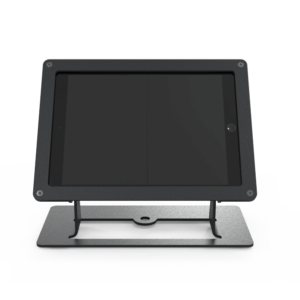 The Heckler Windfall Duo is designed specifically for iPad POS systems, like Revel Systems, which have dedicated customer facing applications. With a WindFall Duo, your checkout hardware now rests directly between you and your employee – transforming checkout in to an enjoyable, shared experience. Secure the new third-generation iPad Pro 12.9-inch for use in your business. 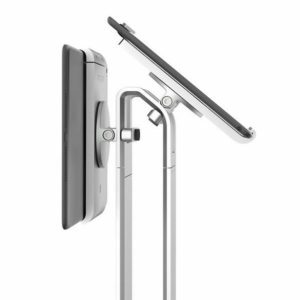 WindFall Stand is refreshed to compliment the tablet’s new all-glass, all-powerful display. With a clean aesthetic and all the clever security details, there are plenty of ways to use WindFall Stand in your space. 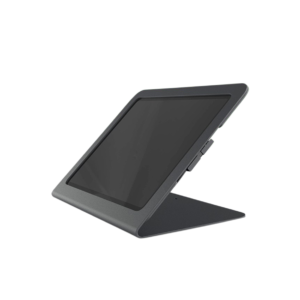 Designed to be both elegant and robust, the Bouncepad ‘Counter’ is perfect for those that don’t want to drill holes into their counter tops and want a well-protected, secure and stable tablet stand for their POS. It’s weighted base is cleverly shaped, great for storing your cables away so you have a nice clean space while charging your device. Secure and elegant — The Studio Proper iPad Stand is designed to enhance the interior of every environment. Including a custom embedded MFi charging cable, for an always on, completely secure experience. The Proper iPad Stand conceals your cables, and keeps your iPad locked securely into place, while remaining powered at all times.